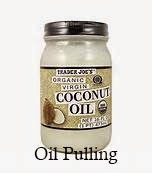 Recently I came across a new trend called oil pulling. It's a simple regimen that you can add to your daily morning routine that will improve your health in many ways. It is quite simple. In the morning, on an empty stomach, swish coconut oil around in your mouth for about 15-20 minutes (apparently if your mouth starts to hurt you are swishing too hard). Just swirl it around and spit it out after those few minutes are up (do not swallow!). What you are spitting out are toxins that are coursing through your blood stream, and by removing them it will lead to a healthier you! They say that oil pulling is probably most helpful for the gums, because it prevents the growth of strep bacteria. Nutritionist and doctors believe that there are beauty benefits to oil swishing as well. Here are three main benefits that I found while researching this new trend. Teeth Whitener. Coconut oil contains natural antibiotic and anti-viral properties that brighten yellowed and stained teeth and helps cleanse your mouth. It improves gum health and also gets rid of bad breath. Acne Reducer. Oil pulling detoxifies the body and helps eliminate toxins resulting in less blemishes and helps with eliminating rashes and/or skin issues. It Can Lead To A Healthy Glow. Oil pulling works by removing toxins and bacteria that leak into your bloodstream These toxins effect your entire body, so by removing them the result is glowing healthy skin. It basically helps you glow, from the inside out! Have you tried oil pulling before? Do you think that this is something you will add to your daily routine? I tried it for like 2 days and couldn't do it. I can't swish that long. Haha! Haha! I know, it's tough. They say though, if your mouth starts to hurt that you are swishing too hard. Try swirling it around rather. Never heard of this - but seems pretty interesting! agreed! Coconut oil is always on hand at home! I am all about the oil pulling. I've been doing it for about a year. Not religiously. I don't do it every day. But I try. It's especially good after a night of drinking. Helps get rid of a hangover quicker. I always use coconut oil, but olive oil is actually supposed to work better. I have yet to try olive oil, but I guess it is worth a shot right? !